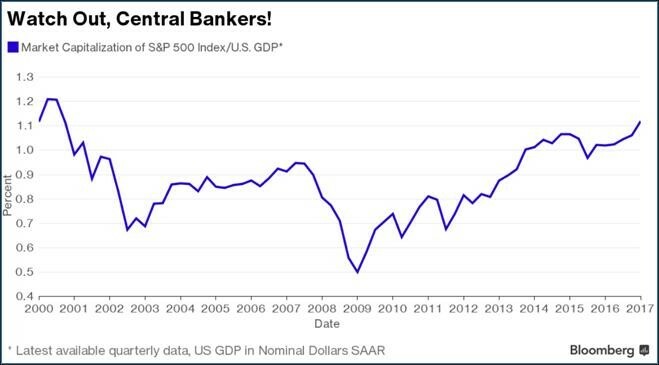 The billionaire investor says that “years of low interest rates have bloated stock valuations to a level not seen since 2000,” and the fact that the current market cap-to-GDP ratio is the highest it’s been since 2000 should be “terrifying” to a central banker. This according to a recent Bloomberg article. Jones’ warning echoes that of many other money managers, the article says, who are concerned that stocks are trading at dangerously high levels. Without specifically addressing market valuations, according to the article, Fed Vice Chairman Stanley Fischer said in a recent CNBC interview, “There are lots of things that terrify me—stock market volatility of the magnitude that we’ve seen for the last couple of years doesn’t. ” Still, Fischer said, the Fed will keep a watchful eye on market movements.